This support note will walk through the process of formatting the Percentage (%) variance fields in report templates using the Report Designer. In this example we will be formatting the Percentage Variance template of the Budget Analysis report to include 2 decimal places in the Percentage Variance field. The same procedure could however be applied to all templates that have a percentage variance field. It is assumed that you are familiar with the Report Designer. If this is not the case you should first read the Report Designer: General Concept. 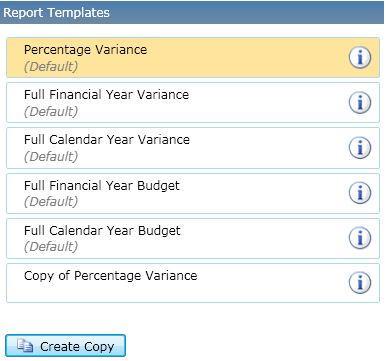 From the Reports list, select Budget Analysis and Percentage Variance template and click Create Copy. Select the Copy of Percentage Variance template from the list and expand the Edit Template options. Edit the template name, report title, and description as required and click on the Design Template Layout button ( ). 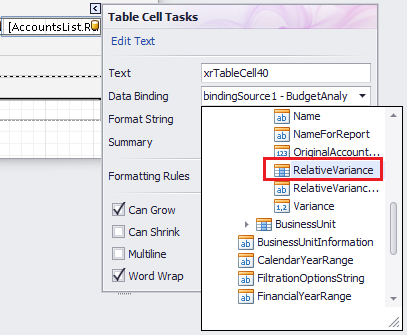 Select the AccountsList.RelativeVarianceString box in the DetailReport1 band. 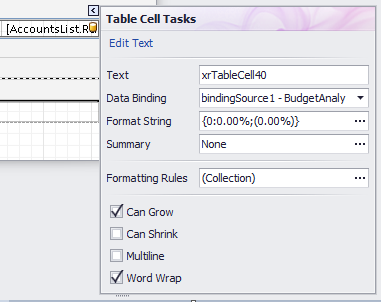 Click on the little arrow in the top right hand corner of the box to open the Table Cell Tasks menu for this control. We will need to change the Data Binding of the control. 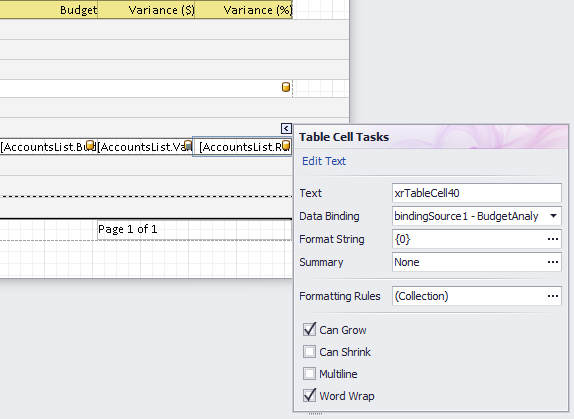 Click on the drop-down menu next to data binding, and select RelativeVariance. Note – The control will currently be bound to a text field rather than the decimal value. This text field is used by default to enable displaying NA where applicable however its format cannot be customised. To test whether the formatting has worked, close the Report Designer and run a Budget Analysis report with the customised report template selected.